NOAH and Hagland Shipping works together to equip one of its bulk vessels with battery hybrid to achieve zero emission operations in and out of port. – The vessel will be the first in its segment with battery technology and electric cargo handling, and is part of the company’s green initiatives, says Jon Arvid Holmberg, head of strategic logistics in NOAH. There are about 300 port calls per year at the island of Langøya outside Holmestrand in the Oslo fjord, where NOAH receives about 800.00o tons of hazardous waste for treatment and storage. Together with Haugesund-based Hagland Shipping, they will now convert the vessel “Hagland Captain” for almost NOK 30 million. The vessel will be converted during 2019, and will be able to sail with zero emissions near shore and in ports. Large battery packs will be installed and enable the vessel up to 30 minutes of electric sailing. 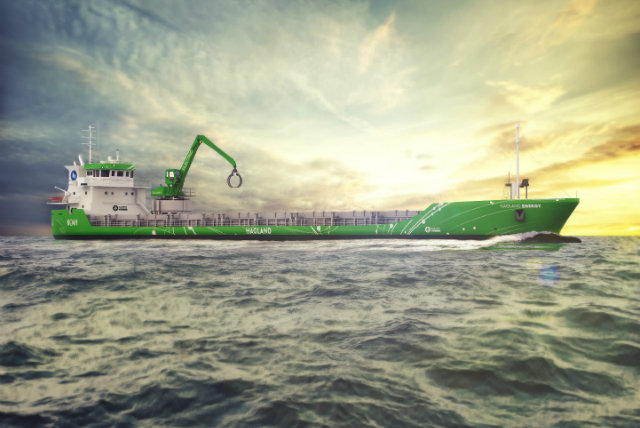 – The conversion will reduce both noise and emissions during the vessels during port calls as well as sailing in and out of ports, says Øivind W. Aanensen, COO of Hagland. Discharging will also be done electrically. Additionally, the engines will be prepared for the use of bio diesel. These upgrades will in combination allow for up to 80-90 per cent reduced emissons. The total investment for the upgrades is estimated to be between NOK 25 and 30 million. NOAH guarantees the investment and shares the risk with Hagland by entering into a 10-year agreement. – With longterm agreements we see that shipowners are willing to commit to technology investments together with us, says Holmberg of NOAH. Hagland will equip, manage and own the vessel, while NOAH is one of several clients who will use the ship for transporting bulk goods. The Norwegian NOx fund has granted a financial support of up to 80 per cent of the investment.